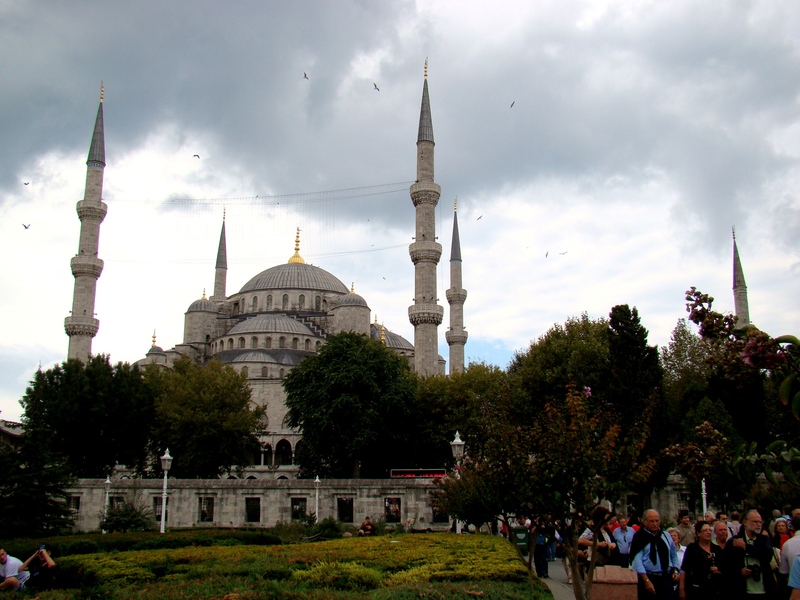 The Sultan Ahmed Mosque, facing Aya Sofya and mirroring its domed silhouette, is popularly known as the Blue Mosque. It is considered to be the last great mosque of the classical period. This huge mosque was build to calm God after the unfavorable result of the war with Persia. The mosque was built from 1609 to 1616 on the site of the palace of the Byzantine emperors, so big parts of the mosque rest on the foundations or the vaults of the old Grand Palace. I must admit that I do have a lot of blonde moments in my travels and having only read about this mosque and never actually having properly looked at pictures of it, I did expect a bluish mosque. So I was quite disappointed when I was told that this huge great mosque in front if me is the Blue Mosque. It was only once I stepped inside that there was any sign of colour. Although the mosque is known for the blue iznik tiles adorning the walls of its interior the overwhelming colour is white and red. Well , still it is not noticeably blue, because the blue tiles are mostly on the inaccessible upper floors. 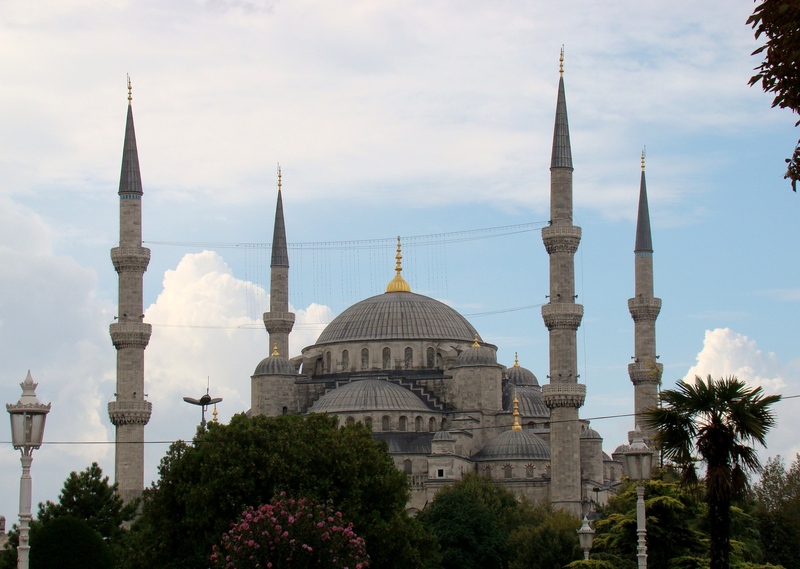 The Sultan Ahmed Mosque is first in Turkey that has six minarets. And to add to my frustration of the day I just couldnt get all six into one photo. Well, it is said that when the number of minarets were revealed, the Sultan was criticized for being presumptuous, since this was the same number of the Haram Mosque in Mecca (the holiest in the world). In the end, the sultan solved the problem by sending his architect to Mecca to add a seventh minaret. I would have thought that removing one from the Blue mosque would be way more cost effective. 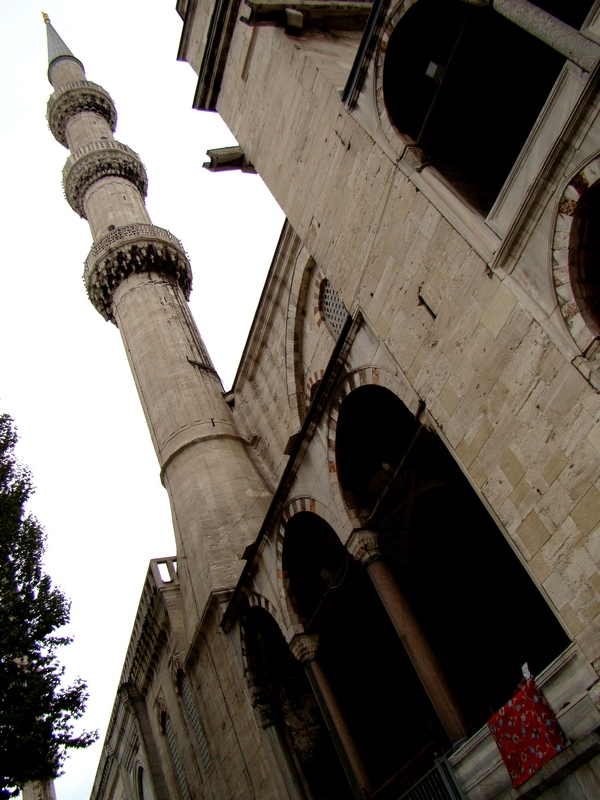 In the past the muezzin or prayer caller had to climb a narrow spiral staircase up a minaret five times a day to announce the call to prayer. Today, a public announcement system is being used, and the call can be heard across the old part of the city, echoed by other mosques in the vicinity. 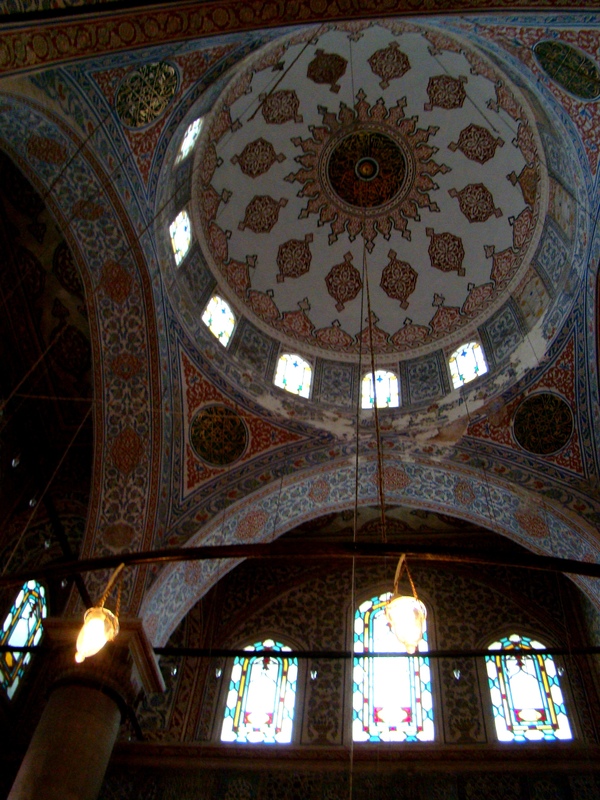 Inside the mosque is lined with more than 20,000 handmade ceramic tiles, made at Iznik (the ancient Nicaea) in more than fifty different tulip designs. The decorations include verses from the Qur’an. There are more than 200 stained glass windows with intricate designs which admit natural light. These windows were once filled with 17th-century stained glass. Sadly, this has been lost and replaced with inferior replicas. The many windows do create a spacious impression. The mosque has some of the most beautiful chandeliers, giving off a soft and calming light. The many lamps inside the mosque were once covered with gold and gems. Among the glass bowls one could find ostrich eggs and crystal balls. Sadly all these decorations have been removed or pillaged for museums. 1) Because of the intense crowds, and the fact that the Sultan Ahmet is a working mosque, you must plan your visit carefully. Prayer happens five times a day and the mosque closes for 90 minutes at each pray time. It is also closed all morning on Fridays (until 14:30/2:30pm). 2) Before you step in to Mosque you take off your shoes and put them in a plastic bags provided at the entrance(so wear shoes that are not a hassle to take off). 3) If you are a women bring with a scarf or shawl as a head covering when you enter the Mosque. Don’t worry if you forget there are head coverings available at the Blue Mosque entrance for free. They actually tell you not to cover your face as the covering is meant to hide your hair only. 33 Responses to The Blue Mosque isn’t Blue? When we fist saw it, we all assumed it was the Aya Sofya! Piece of art! They are so beautiful! Would love some of those tiles somewhere in my house someday. I’ll be writing about new stuff to discover in Istanbul that are not so visible to tourists. Oh wow how wonderful, I would love to go and explore Istanbul again. I do hope you get to see the inside of this mosque as it is so amazing. Thank you! Those windows are amazing and they are art works on their own. I agree, this building is a pice of art! 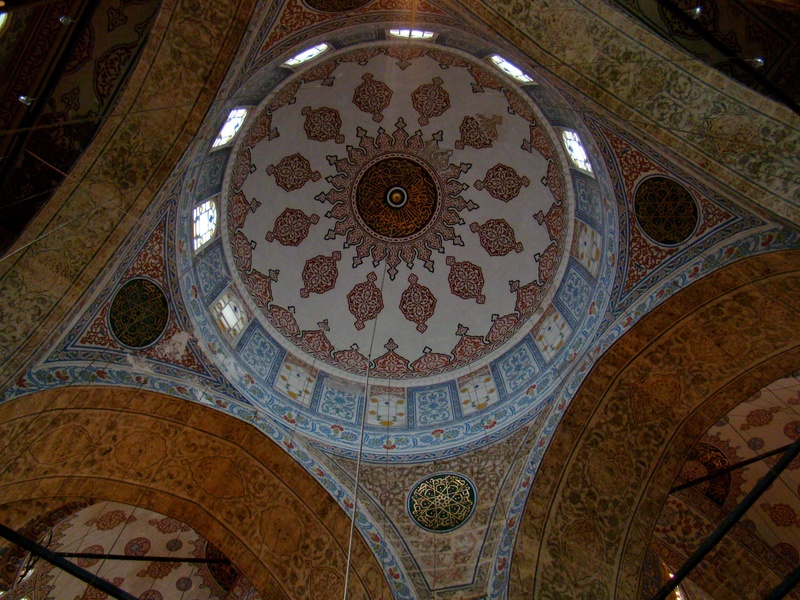 I do love the intriqate art of the mosque, especially on the domes. So the Blue Mosque is actually grey! A huge thank you for the reblog!! 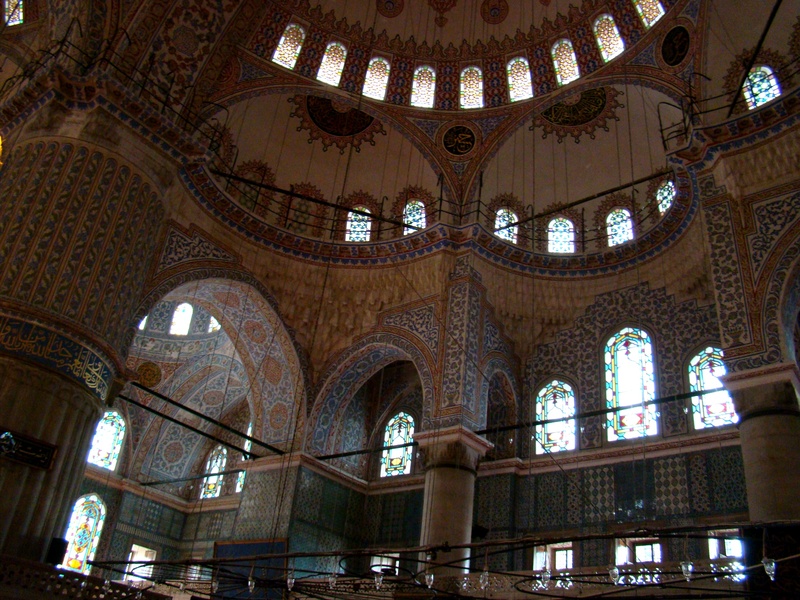 These are awesome shots of the majestic blue mosque! Thank you Amy! It was such a beautiful mosque to explore, I would have loved to spend more time there. 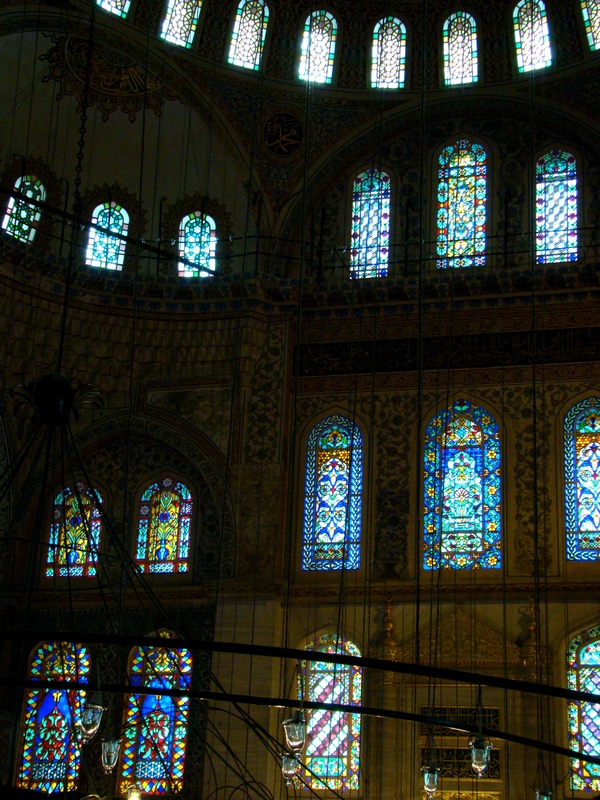 Is it usual for mosques in Turkey to have stained glass windows? Not all the mosques in Istanbul had stained glass windoes but the main mosques all did which is quite special as I have never seen other mosques with stained glasses. Wow, this is breathtaking. So beautiful. It amazes me how these buildings were constructed at the time they were! If one were built today it would be a modern marvel. It is amazing that these places are still standing and that so much of the detail has survived…they dont put that much detail into modern buildings anymore. Grey, blue, whatever. All gorgeous. And inside: Love dome ceilings no matter what! 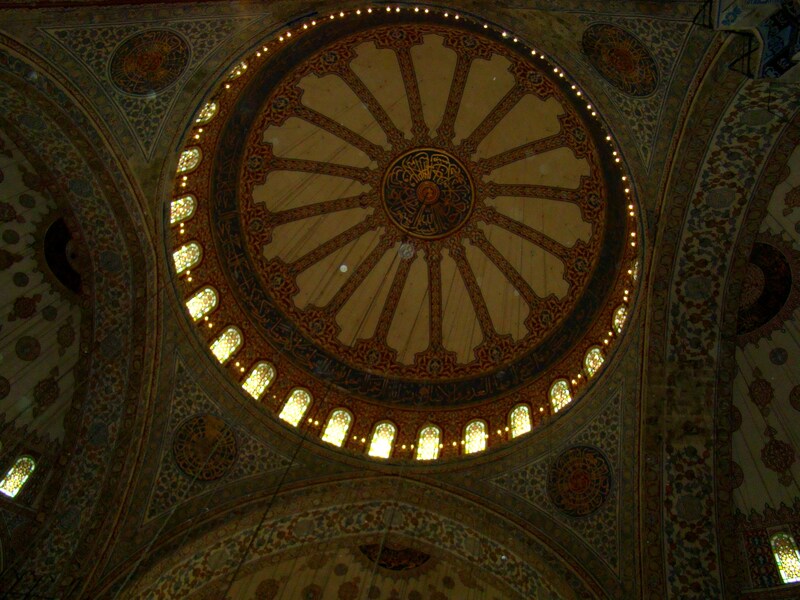 Yes I do agree those domed ceilings are gorgeous! Yes, eventhough it isnt blue it is really very beautiful. I agree, places with a colour in the name should be that colour as it helps to lessen the confusion when you are out searching for them. Wow, that sounds like a fabulous experience, I would love to do that. 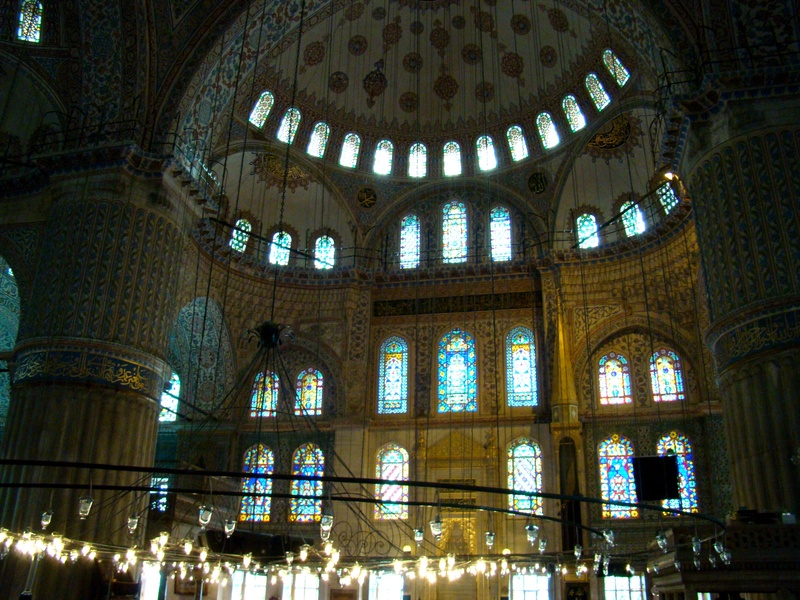 this is indeed beautiful – a great experience to visit – I learned upon my visit the following: At Blue Mosque lower levels and at every pier, the interior of the mosque is lined with more than 20,000 handmade ceramic tiles, made at Iznik city (Nicaea) in more than fifty different tulip designs. It is definitely one of the most beautiful mosques I have ever seen and the detail inside is just amazing. It is beautiful. We stayed near it when we visited Istanbul, and it was a surprise the first morning to hear the call to prayer over the loudspeakers, but we soon grew accustomed to it. I liked the reminder each day of where we were, even before we opened our eyes. What a beautiful place to stay! Whenever I hear calls to prayer it takes me back to my big adventure in Istanbul, it is such an integral part of that amazing city.